It’s always exciting to discover new lands, their natural beauty and historical background, to learn about cultural heritage and the way of life, and to listen to legends which stimulate your imagination. 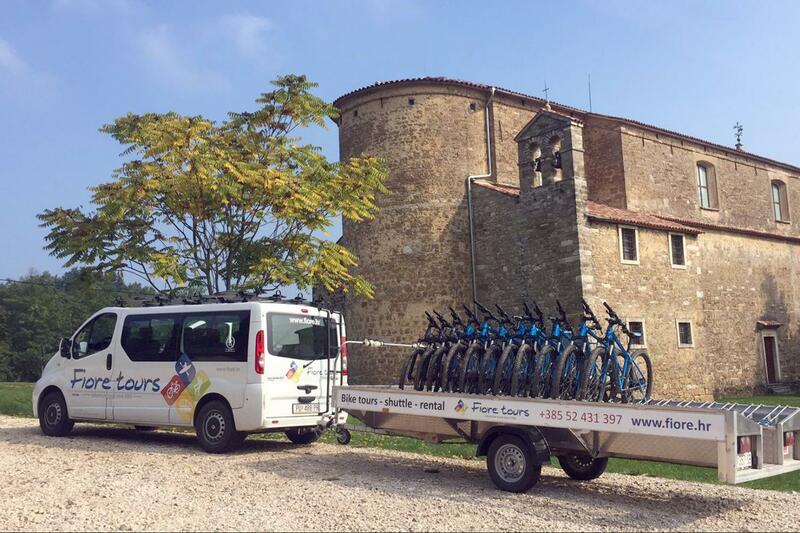 Join us in exploring the former narrow-gauge railway line Parenzana, which was turned into a true attraction for cyclists! You will be thrilled with the small picturesque towns, and landscapes dotted with old villages through which you pass. Sweeping into beautiful valleys with forests and rivers framing them and then emerging onto the slopes of the hills, the beauty of the nature will take your breath away. Take a short break and soak up the abundance of peace and greenery. On this interesting trip you will pass through tunnels, over bridges and viaducts, between olive groves and vineyards that give this area special charm. The medieval hilltop towns of Grožnjan and Motovun will delight you just as much as the pristine nature of the protected areas of Lim Bay, the ornithological reserve at Palud and Cape Kamenjak (Rt Kamenjak). Do not miss unique Porec and the former Roman colony of Pula, and feel the magical spirit of the past there. 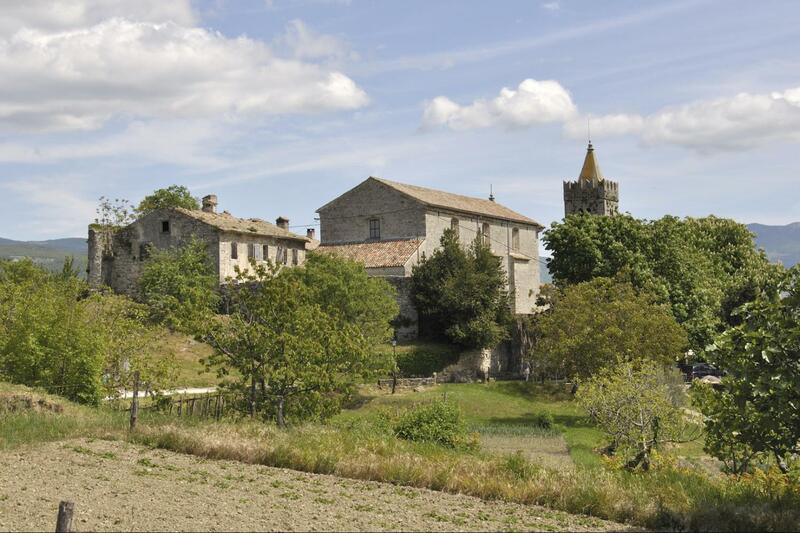 a landscape of hills framed by rivers, with forests, vineyards and olive groves, you’ll enjoy every moment. Take a break at the winemakers and taste indigenous wines such as Malvasia and Teran, treat yourself to tasty delicacies and experience all the charms of Istria, this exciting Croatian wine region. Independent arrival in Istria. In afternoon meet your tour leader for a brief orientation meeting followed by a dinner together. Overnight in rural hotel Parenzana in a small village Volpija close to town Buje. From Buje you will continue towards to Grožnjan. Typical Istrian medieval town sprout high on top of the hill along the right coast of the river Mirna, renaissance loggia dating from 1585 and the beautiful St. Vid and Modesto’s baroque church. If you just occasionally ride along its streets in which almost every door leads to art studios or galleries, and which windows from every direction echoes the sounds of different music genres, from classical to jazz, you’ll understand why Grožnjan is known as The city of artists. Oprtalj, unchanged urban medieval style of building, the narrow streets, the shops, the beautiful Venetian palaces, portals and covered passages, and particularly the unique view to the Istrian peninsula from the town loggia, according to many the most beautiful of Istria. From Oprtalj you are going downhill enjoying the view on Mirna river and arriving in Motovun, one of the best preserved medieval hilltop towns. Overnight in Motovun. In the morning we are driving to small village, we are going to meet local family who lives from truffle hunt. Unusual underground hidden bulb, with no pIncludedlant above ground is very difficult to find. Only, a well-trained dog can sniff them. During a walk through the forest truffler will tell us all the secrets and particulars about truffles and of course you will have opportunity to taste different products with truffle and local wine. Overnight in Motovun. 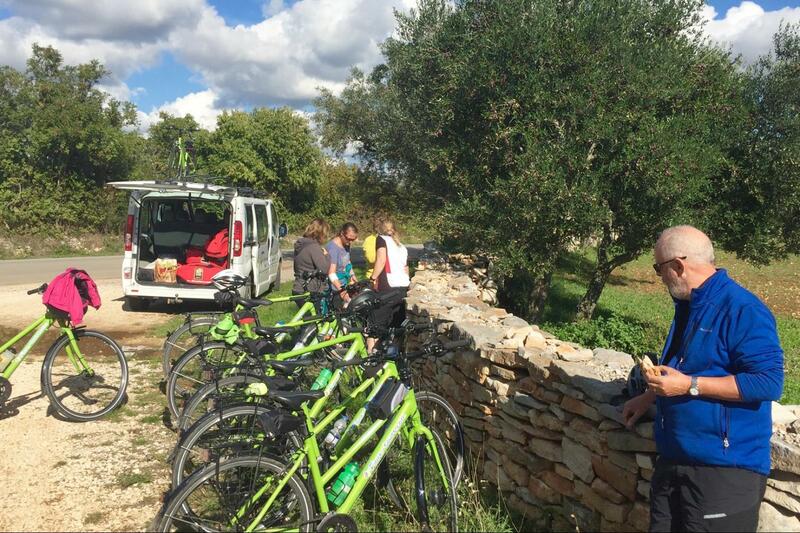 From Motovun, we cycle back towards the coast, again following the old track of the Parenzana. We drop down out of the village and follow the track through a 200 metre tunnel, emerging to find views across the Mirna Valley as we leave Motovun behind us. We stop for a coffee in Vizinada after an hour or so and then continue towards the coast. 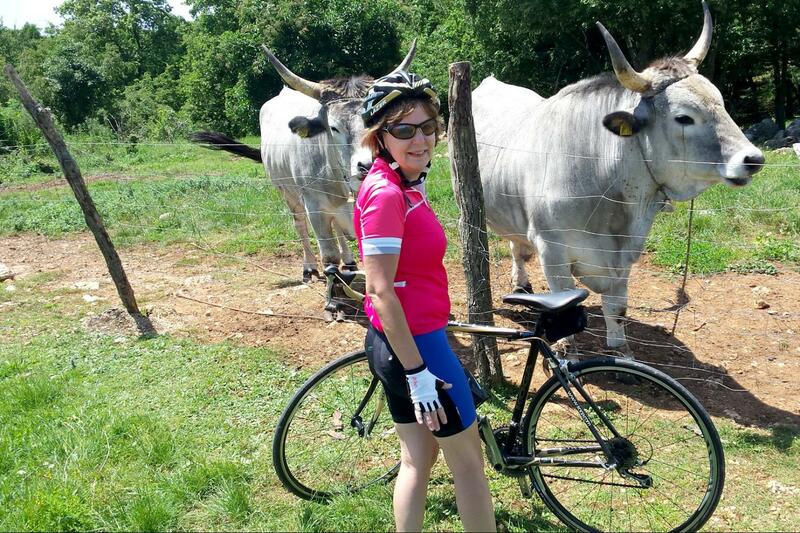 At times, although we are still following the route of the Parenzana, we find ourselves cycling on the bare, red Istrian soil, as we pass on farm tracks amongst pretty vineyards and olive groves. We stop for lunch in Visnjan, a hilltop village notable for its architecture and for its astronomical observatory. From the village square, at an elevation of around 250 metres, we can actually see the sea. After lunch we have an enjoyable 15 kilometre ride out to the coast, passing the last of the old Parenzana railway stations just before we reach Porec, a town famous for its UNESCO listed basilica and charming old quarter. Overnight in Vrsar. After breakfast we will start with our sea kayak adventure along the protected area of Lim fjord. You will enjoy paddling along the bay, with its steep banks, passing beside the cultivation of mussels and fish to the end of Lim bay. During the trip we will stop on a wild beach for swimming and snorkeling. Hike to the Romuald´s cave, a 105-meter long cave consisting of several impressive halls that have preserved evidence of permanent existence of life since prehistoric times. The entrance to the cave is 47 centimeters high, and the main hall is five to six meters high. Romuald's Cave is a speleological phenomenon because the cave ornaments are located on the left side only, while the right side is empty. Dinner is on your own tonight, so you’re free to explore town of Rovinj with fantastic selection of local taverns. Overnight in Rovinj. After short drive we arrive in small fishermen village Fažana, where we will embark on a boat which brings us in 25 minutes to Veli Brijun island. Brijuni Archipelago, 14 green jewels of the northern Adriatic, is one Croatia's most beautiful National Parks. Northwest of Pula, separated from the mainland by 3 km wide Fazana channel, the archipelago covers an area of 736 hectares, numerous picturesque coves and inlets forming a beautiful 44 km long coast. A mild Mediterranean climate enables more then 680 different local and exotic plants to grow here and to be the home of some 150 species of birds. Lovers of historic buildings will immediately admire the many archaeological finds, from the Neolithic settlement, Illyrian ruins and many ancient monuments. Visit of the island can be done using the bicycles on easy and flat terrain or on foot. The tour continues towards the village of Vodnjan where you will be welcomed by one of the best olive oil producers, Chaivalon Extra Virgin Olive Oil. You will learn everything about the production of olive oil and you will have the opportunity to taste different varieties of istrian olive oil. Overnight in Pula. After we start the last biking tour along well-intended coast to Cape Kamenjak, surrounded by the 30 km long coast with numerous gulfs, bays and white beaches washed by the crystal clear blue – green sea we reach ancient Mutila, nowadays Medulin. On the way we can find 22 types of orchids including the endemic specie "Serapias Istriaca" (the Istrian orchid), see the so-called "islet - plate" where the dinosaur's footprint has been preserved or find the remains of luxurious Roman villae rusticae. Later we are going to explore Pula, the largest town of Istrian county with lot of great monuments like Arena, (UNESCO) the most important monument in Istria from the Roman antiquity, erected in the 1st Century AD. When strolling around the Old Town, you will view the grandeur of Pula's impressive monuments, such as The Arch of Sergii, Hercules's and the Double Gates. Overnight in Rovinj. You should be in a moderate physical condition to do this trip. Hotels are 3* with very excellent service. We supply helmets, hand pump, puncture repair kits, cycle computers (measuring speed, distance etc. ).rear rack and bottle holder. We recommend that you bring a lightweight waterproof in case of showers. On longer tours, you might like to, wear cycling shorts or padded under-shorts, cycling gloves and cycling shoes (or stiff-soled trainers) as these will make your ride more comfortable. Sunglasses protect your eyes from bright light, and also from airborne insects – a particular hazard if you are speeding downhill on a bike.